WALK UP MOUNT SNOWDON FROM THE FRONT DOOR! Emma and Menno welcome you to their warm and cosy Bed & Breakfast and Tea room Tŷ Mawr, ideally situated for a holiday in the mountains of the Snowdonia National Park. Tŷ Mawr is located in the tiny village of Rhyd Ddu, 15 km south of Caernarfon. 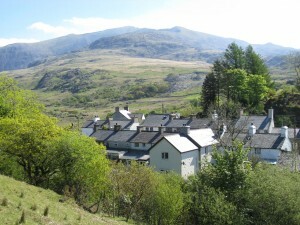 You can walk up the Rhyd Ddu Path to the top of Mount Snowdon (1085 m) from our front door. Rhyd Ddu lies on the A4085 between Caernarfon and Beddgelert. There is a good bus service to both places. There is also a fantastic signposted walking – and cycling path between Beddgelert and Rhyd Ddu through the Beddgelert Forest. The 7.6 km path is called Lôn Gwyrfai and if you click on this link you’ll find a map of the route. We are also conveniently located if you need a little rest whilst on your way to Holyhead to catch the ferry to Ireland. The flooded Dorothea Quarry in the Nantlle Valley (108 meters deep) is 9 km away. Many interesting walks start from the village; the Rhyd Ddu path to Snowdon, the Nantlle Ridge, Moel Hebog, Yr Aran, plus forest walks. Tŷ Mawr – ‘Big House’ – is a more than 200 years old stone cottage and has three double rooms, one of which has en suite facilities. The two other rooms share a bathroom with shower and separate bathtub. All rooms have central heating, television, hairdryer and a tea – and coffee tray. In the Tea room we serve several sorts of tea, all day breakfast, sandwiches, toasties, homemade soups, baguettes, chilli con carne, omelettes, cakes, ice cream, etc. Menno’s Dutch pancakes are recommended for the hungry walker!!! We speak English, Dutch & German. Please click on the flags at the top to read this home page in Dutch and German. We serve a hearty breakfast to set you up for the day (you can even try a pancake). Packed lunches are available on request. Our rooms in the B&B are not suitable for children younger than 8 years. Sorry, no pets allowed in the B&B and tea room. On the road, opposite the B&B. 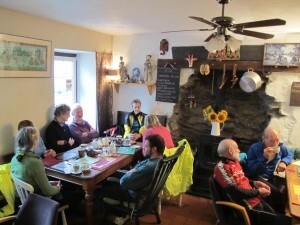 The Cwellyn Arms serves real ales and good food and is less than 200 meters away. some spectacular countryside to Caernarfon and Porthmadog. Free wireless internet access available for B&B guests. 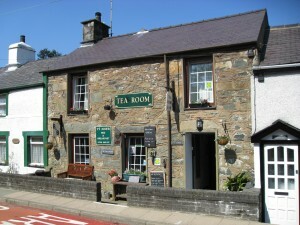 It will be very hard to find a B&B closer to Mount Snowdon than Tŷ Mawr! 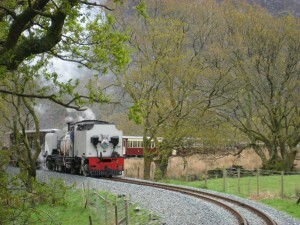 Trail magazine of July 2013 said: ‘The Rhyd Ddu Path arguably offers the best Snowdon ascent’. Please check Tripadvisor (B&B and tea room), Tripadvisor (tearoom) and the Guardian where you’ll find a review at the Readers’ tips of the Travel section.